Whether it's back-to-school time, first-day-of-school time, old-bag-is-broken time or just fancy-a-change time, these personalized school bags are totally unique and bound to be popular with your little one. Create your very own custom book bags with our user-friendly online design tool, they'll be made to order with a super-fast turnaround time; perfect for those last minute "I forgot it" moments. Designed to accommodate laptops/tablets up to 17"
Your personalized book bags are made here in our studio to order. That means that every detail has been lovingly hand crafted just for you. 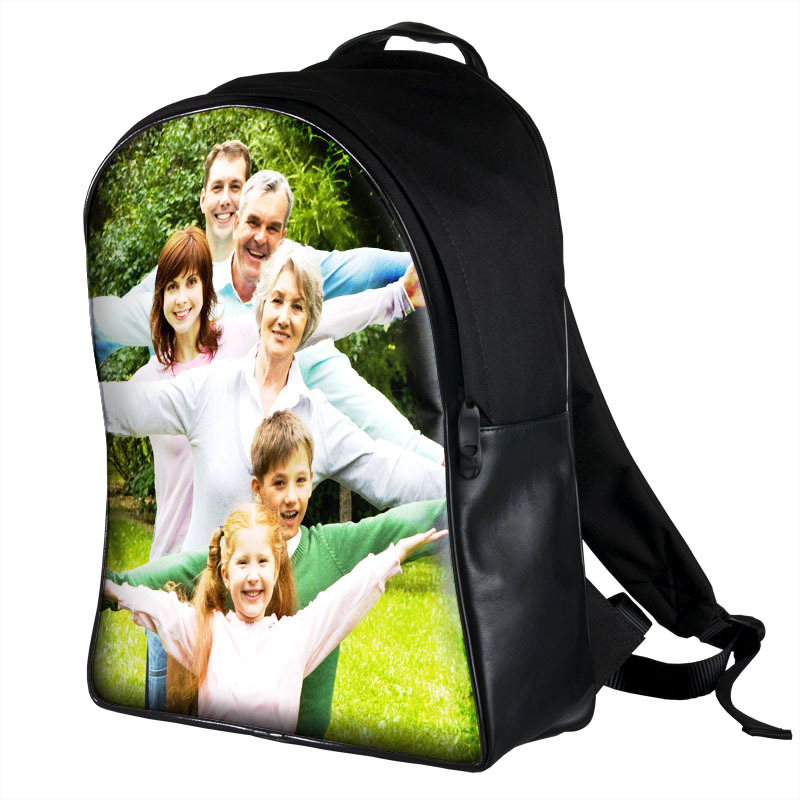 We print your personalized school backpack design directly onto the canvas fabric, to ensure that your design is featured in full color, from edge to edge. Once this is done we cut and sew each of the panels, including your printed one, by hand. The end result is your high-quality, personalized school book bags, made exactly as you designed them. My image was a little small so was unsure it would work, but the team assured me it would be fine.. and it was more than fine! It looks AMAZING!! As with all of our products, you can use our simple, online design tool to make your own school bag. The space that you can personalize on this backpack is large, however, due to the design of the high-quality leather and canvas bag, there is only one customizable side; this makes it super-simple and within a few easy steps you can have your order...well...in the bag. You can choose the background color for the canvas front of your personalized school backpack from our color palette. This is a full palette so you can choose not only the exact color but the precise shade that you want this to be. Now you have your background color picked, its time to use the online editor to create your design. You can upload images from your computer, or take them straight from Facebook or Instagram; you can even pick an image from our extensive library which features emojis, flags, patterns and much more. That's it, it really is that easy to design your own school bag. Our online design tool features a red checkered edge to your custom school backpacks front face; this is the bleed area. Whilst you need to ensure that your design spans this area, please ensure that no important details are within the bleed area, as this may be cut. (Please note that if you select a background color, this checkered edge will become a darker shade of your chosen color). A number of our products benefit from great quantity discounts; this personalized book bag is one of them. To benefit from this fantastic offer simply add more than one of these items to your basket, and the discount will be automatically applied. The best part is that both custom school backpacks don't need to feature the same design - ideal for if you have more than one child and want to beat those back to school blues. When you personalize your own school bag, you are designing the front face of the bag, which is made from our high-quality canvas. This will be printed edge-to-edge with your design. Surrounding the front face you'll have a glossy black edging, which will beautifully frame your personalized school book bags design. The base of your bag, along with the lower half of both the right and left sides will be made from our Italian Nappa leather, as will the handle on the back and the base from which your shoulder straps are seated. For added comfort, the back of your personalized school bags and the straps will be made from padded canvas. The same high-quality canvas which has your personalized school bags printed design is used to make the top part of the backpack, where each compartment has its own zipper, with twin ergonomically designed zips. All the edges of your personalized school backpack which would face the great outdoors has been lined with durable, waterproof material. This leaves you safe in the knowledge that your bag's contents are protected, even if your child gets stuck in a downpour. The mid-compartment - accessible from the front zipper - is made from super-soft faux suede for a luxurious feel, and has a smaller zipped compartment which is faux suede lined and features an ergonomic zip. When you design your own school bag, the front face is customizable by you entirely. It's such a roomy canvas we struggled to choose our favorite ideas. We love the effect you get by uploading multiple photos and creating a picture collage - choosing a background color that compliments the snaps you've chosen. The great thing about this tip is that your background color fills the bleed area, with your pictures more centralized so there is no possibility of any design being obscured, or any white parts being left. You can either use one of our montage templates or position the photos yourself to make your own schoolbag entirely unique. Did you know that in England, all three and four-year-olds are entitled to 570 hours of free early education a year? Depending on your circumstances, some two-year-olds are also entitled to this, and if you meet certain work criteria this is doubled to 1,140 hours a year. Our personalized school bags are so lightweight, that they are perfect for being used as a personalized toddler backpack, exactly to your design. Personalize your own school bag regardless of the age of your little one. Personalized pencil box. We print a quality image and gloss laminate it to the tin box to make a personalized pencil boxes. Great as kids lunch bags. Unique and personalized so won't get lost. All yoga lovers need to stay hydrated, so design your own ceramic water bottle in 3 sizes and refresh yourself in style after a vigorous practice.